In the Light of What We Know is a book about ideas (think Gödel and the title), mathematics, philosophy, perception, psychological and sociological, and very importantly, social class, mobility. etc. on through 9/11 and beyond. It’s a very ambitious book and it’s somewhat confusing in places but the ambiance, the tone, the style, is so incredible it works smoothly in spite of what could easily have become choppy. The unnamed frame narrator is the Pakistani-American, now divorced and unemployed due to the financial crisis of 2008. But he is listening to the story Zafar tells him which is the story of his life, basically. And they are recording the telling and Zafar has notes written in notebooks. The conversations take place over a period of days and in different locations and although they are basically about Zafar’s life and start out chronologically, the talk drifts. The digressions are many and long, sometimes with foreshadowing to the point of forward-takes, sometimes with a lot of back story told to develop a theme or motif, sometimes memories of other conversations in other places. Sometimes the protagonist slips back in unannounced to relate his background or ideas on it all, his side, his life. After about halfway Zafar’s tale is mostly chronological. The narrative voice isn’t much different from Zafar’s but that may deliberate to enhance a theme. The change in narrators is sometimes confusing, but it sorts out nicely and gives the whole a nice meandering effect rather than a choppy one. 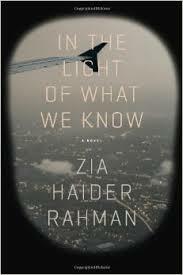 In coursing through Zafar’s life, the two friends touch on everything from the beauty of mathematics and philosophy to religion and politics, from education to marriage, from the Bangladeshi War of 1971 to the war in Afghanistan, from elite schooling, love, marriage, and the financial collapse of 2008 – there’s a lot in here. This is a deeply ambitious novel. The friends have very different takes, ideas, perspectives and knowledge. But what is it they know? the truth? in what sense? Only the first half of chapter 11 got tedious – narrator and his father discuss finance and risk, but I suppose it contributes in it’s own way – still, it’s a long book with a lot to say.